I consider myself an expert at meditation because after 15 years of meditating regularly I estimate I’ve meditated over 5000 times. In psychology there is a type of associative learning known as “classical conditioning”, which describes how a behavioral response can become associated in your mind with a neutral stimulus. For example, when your mother called “dinner time”, you’d soon be at the table eating food and as a result of eating food, your mouth would be salivating and your digestive enzymes flowing. Your mother yelling “dinner time” is a neutral stimulus and the first few times you heard it your body had no response. However, overtime you would begin salivating and producing increased digestive enzymes just at the sound of mother calling “dinner time” because your mind and body have learned that neutral stimulus from your mother is always immediately followed with you eating food. In fact, she could have been a little mean and yelled “dinner time” even though she’d not prepared any food at all and you’d still start salivating because your response had been classically conditioned to occur with the neutral stimulus of her calling “dinner time”. When you understand this is how your mind works, you can use it as a powerful tool for forming new habits. Find a place in your house which is private and comfortable that you will be happy spending regular time for the practice of meditation. Get the lighting right, arrange your cushions for maximum comfort, whatever it takes to get you relaxed (without falling asleep). This is going to be your ‘special place’, where you meditate each time. After you have been meditating frequently for a few weeks, you’ll have classically conditioned yourself to immediately begin relaxing just by going to your special place. And when that happens, you’ll find you are able to go into a deep state of relaxation very quickly. Do whatever it takes to help you easily enter a deeply relaxed state. I sit upright with my back against something for support and my legs folded in front of me with my hands in my lap, palms facing up. 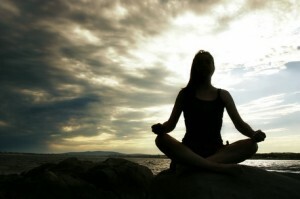 Often in images of people meditating you’ll see they are sitting upright with no back support. Let me tell you that position becomes very difficult to maintain without slumping forward with a tired sore back after a few minutes, especially if you are a beginner at this. Take my advice and lean against something. If you can’t fold your legs in front of you then just sitting with feet on the floor is fine. Don’t lay down because you’ll sleep, which is not what we want to achieve here. Once you have found a comfy position, use it every time for the same classical conditioning benefit, that is, just assuming the position will begin your descent into deep relaxation. 4. How Do You Think About Nothing? By that I mean, meditation is a time of ultimate relaxation and self-acceptance so there is literally NOTHING you have to do. Giving energy to the things I want. I imagine very clearly, already having the things and circumstances I want in my life. 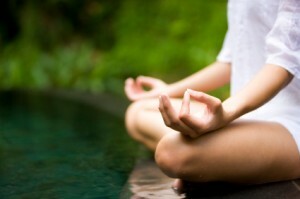 I suggest you meditate about 3-5 times a week, daily is great if you really enjoy it. You will find with meditation that more you do it, the deeper the state of relaxation you achieve and the faster you achieve it. I’m making this point because if you meditate too infrequently you‘ll find your sessions much less satisfying and much less effective. When I go a week without meditating, it will take 2-3 meditations before I’m able to go into the same deep place I find so peaceful and rejuvenating. Don’t beat yourself up if you miss a day but also, don’t take it so easy on yourself that you go without meditation altogether, despite having the intention to do it. Try to meditate for a minimum of 10 minutes, any less and you are not giving yourself the chance to really achieve a deeply relaxed state. You may find the first few times you meditate that you’re restless and not really getting to relax… that’s fine and completely normal. The first time you strapped on snow skis you didn’t slalom down a black diamond run, right? Well meditation will also take practice, but the good news is you’ll be good at it quickly because deep relaxation and inner-peace is a very natural state for a human being. As you get better at meditating, extend the sessions… no need to pressure yourself to stay, just go longer if you are enjoying it. I personally meditate for about 20-40 minutes and the longest I have ever meditated is about 1hour 45 minutes. It may sound impressive but I’ve read about 12 year olds in India that can meditate for 8 hours straight! SIDE NOTE: There is a young man in Nepal, called Ram, that at the age of 15 sat under a tree to begin meditating and did not move for 16 month. When I say “did not move”, I mean he did not eat, drink, sleep or use the bathroom for 16 months. Word got around and soon pilgrims from all over were coming to see him because they believe he is the re-incarnation of the Budda (he’s known as Budda-Boy but says himself he is not the re-incarnation of Budda). Eventually he disappeared into the jungle because the throngs of pilgrims were disturbing his meditation. Most recently he was found meditating in a specially created 7’x7’ underground bunker to avoid being disturbed. You can do a Google search on ‘Budda Boy’ to learn more about him. Research published in a 2009 edition of the European Journal of Social Psychology by Lally et al has shown that the more you repeat a new behavior in the first 30 days or more (up to 66 days) the greater chance you have of it becoming a new habit, so for the next 30 days try meditating every day. Meditate in the same place, sitting in the same position, at the same time of the day… what I’m saying is make it a ritual. Now I’m not saying ‘make it a ritual’ for religious or philosophical reasons, I’d never lay that on you… I’m saying ‘ritualize it’ because research shows that you are more likely to continue the behavior if it is ritualized (done the same way, in the same place, at the same time, every time). Stick with it and the pay-off is your brain will quite literally form new neural pathways, making it much easier to continue with the new habit. How Can You Survive Without Meditation? I’ve been meditating regularly for many years and quite frankly, every time I go more than a couple of weeks without meditating, I struggle to understand how the rest of the world manages to cope with daily life with no meditation at all. I think the real answer to that question is they don’t. Most people struggle through life to some degree and often the stresses they experience manifest in their lives as relationship problems and their bodies as illness or physical distress. Irritability, headaches, dissatisfaction, moodiness, depression, tiredness, forgetfulness, aches and pains, illness, disease, skin problems, weight problems, aging… all these complaints and many more are associated with chronic stress. I think it’s crazy almost no one meditates. It’s my prediction that in a few generations from now meditation will be the norm rather than the exception because of its scientifically proven effectiveness in improving both academic and athletic performance and in managing the daily stresses of a busy life. It’s widely accepted that people who meditate regularly appear younger than they really are. I’ve been meditating now for 15 years and everyone I meet is shocked to hear I’m over 40. Most people presume I’m 30-33 years old. When I was a kid I looked old for my age, at 20 most people thought I was about 25. So if you do the math, in appearance I’ve aged only 5 years in the past 20 years. Haha… while that’s probably not the reality it’s what I like to tell myself. But jokes aside, the truth is I look quite a bit younger than I am and I truly believe a lot of it is due to the regular de-stressing I’ve given my body over the past 20 years via meditation. Stress ages you because cortisol, the hormone of stress, results in collagen loss in your skin and when your stress is chronic, your cortisol levels are permanently high resulting in extensive collagen loss in your skin. When collagen decreases in your skin, your skin falls into the areas where the collagen has been depleted… a.k.a., wrinkling and premature aging. We’ve already established that weight loss is hastened by proper stress management. You absolutely MUST be doing something to manage your stress. If you’re not, you are making life unnecessarily difficult and confusing, and your weight loss a bigger struggle. 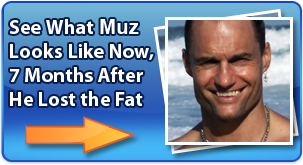 Even worse, you are aging your body prematurely AND turning it into a fat-STORAGE machine. So, ideally, you should be doing something to de-stress at least a few times a week. What makes a Good Stress-Management Activity? The only true escape from stress is your inner peace. By this I mean the activity you choose to manage your stress should pull your ‘presence’ into yourself and not out. For example, when you sit alone and listen to peaceful music with your eyes closed, you can shift your consciousness so you become less aware of your outer environment and your consciousness becomes more of an inner experience. Within all of us is a connection to the same deep pool of wisdom and peacefulness that is totally accepting of who you are, profoundly calming and soothing to your psyche. Since this is the real goal of stress-management, I don’t do activities that ‘kind-of’ create an environment where this can happen, like listening to peaceful music. Instead I very deliberately go to this inner place of self-acceptance and tranquility via meditation because it is the most direct route. By turning away from outer distraction and allowing a peaceful transition to this inner place you are revitalized and your energy field is cleansed of the disturbances that result from stress. And in that process, I lost the weight I wanted to lose, and kept it off! Therefore, if you hope to lose weight then you need to manage your stress and give your body to opportunity it needs to recuperate. All of these functions prepare you for physical readiness in a ‘fight or flight’ situation. Cortisol is produced by the adrenal glands which sit atop the kidneys, the same glands that produce adrenalin. Adrenalin and cortisol are produced in larger amounts during stress but the effects of adrenalin dissipate quickly after a stressful event while the effects of cortisol are longer lasting. Hence chronic stress becomes detrimental for your health because the effects of the elevated cortisol levels are never given time to fully dissipate. How Does Cortisol Make You Fat? Cortisol contributes to fat gain in a number of ways. High cortisol levels cause muscle breakdown which lowers metabolism. We know by now a lowered metabolism means you burn less energy and store the unused nutrients as fat. But not only does it metabolize muscle, cortisol also reduces levels of your androgens (male hormones) and growth hormone, which are responsible for muscle building. Cortisol is also a counter-insulin hormone, which means it works in opposition to insulin, thereby increasing your insulin resistance. Your pancreas compensates by increasing insulin output, which has the side-effects we discussed previously of increased glucose lipogenesis (glucose converted to fat), increased fat deposits around the waist and increased appetite. Even thyroid function is effected by elevated cortisol levels and the resultant lowered T3 levels in your blood lower also contribute to a lowering of your metabolism. All these factors contribute to weight gain and obesity, which is not surprising to hear. However, what you may not be aware of is the physical stress of obesity increases your cortisol levels! It becomes a self-perpetuating feedback loop. And the fat gain is mostly visceral fat because visceral fat cells have many more cortisol receptors than fat cells found elsewhere in your body. Visceral fat is the fat found in your abdominal cavity and intra-muscularly as opposed to beneath the skin. The bad news is visceral fat is most closely associated with severe health risks like heart attack. We now know increased cortisol levels from stress stimulate cravings for sweet, high energy foods and your tendency to overeat is amplified. But what you may not know is this effect is compounded if you use food to comfort yourself when emotionally stressed. Let me explain why it’s more likely you comfort yourself with food than you imagine. As a baby, when you cried for whatever reason, your mother probably checked your diaper and if it was dry she stuck a bottle in your mouth. You may have been crying for an entirely different reason other than hunger but were soothed none-the-less by the warm, pleasant tasting formula. The hard-wiring effect on your brain is probably still in place and functioning such that you find some comfort in consuming food when you’re stressed. Other people smoke (which is the similar action of putting something in their mouth) for the same reasons. Now if you’re stressed and over-taken by cravings for the wrong foods PLUS you are a comfort eater, you can see the problem. Changing this behavior takes effort but if the stress persists, the battle will be uphill all the way. 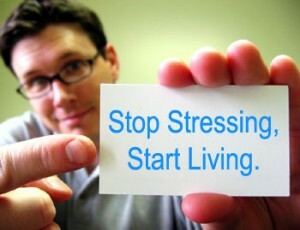 Instead, learn to manage your stress and you’ll find “making the right decision” a whole lot easier. GH gets a mention because it is partly responsible for building muscle and burning fat, both of which make you leaner. However, GH is secreted according to your circadian rhythm, which is the natural daily rhythm your body operates by. So GH secretion is highest when you’re sleeping. But sleep quality and duration suffers under chronic stress, resulting in reduced GH production. Even if you’re sleeping ok, stress can decrease your GH levels by affecting your brain and pituitary gland (GH is produced in your pituitary). 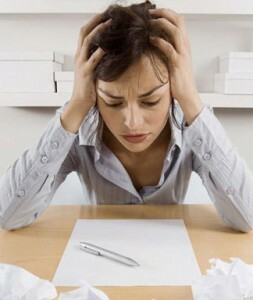 Stress also causes damage to the GH receptors in your cells, which creates GH resistance. Unlike your pancreas, which can produce more insulin in the event of insulin resistance, your pituitary is not able to produce more GH. Survival Stress – this applies to the type of event we originally evolved the stress response to survive. It is stress in response to a dangerous situation like fighting off a mugger or running from a savage dog. Emotional or Internal Stress – this type of stress is the result of worry, anguish, anxiety… any emotions that disturb you. It is stress in response to getting yourself worked into a state about making enough to cover your bills this month or worry your child is 1-hour late returning home from a friend’s house or fear and worry your relationship maybe ending. Fatigue and Overwork – this type of stress is your body’s response to chronic exposure to long hours and urgency at work or home. Being in an elevated state of urgency and pressure to complete projects can be good to meet deadlines but when the pressure is a daily work staple, even if you feel you’re coping ok, long-term exposure can have detrimental effects. Physical Stress – this type of stress is your body’s response to physical exertion, temperature extremes, poor or under nourishment (as in a fad diet) or illness. This brings us to the question: Is there such a thing as “good” stress? Not all stress is bad. In fact without any stress, life would be very mundane and no one would achieve anything of significance. We all need stress to achieve peak performance, and research has shown that as your stress response increases so does your performance. But beyond a certain point, if your stress continues to rise, your performance begins to decline. The optimum use of stress is limiting it in degree and in duration. Unfortunately, in today’s demanding life controlling your stress is an ever losing battle, instead the answer lies in managing your stress. Stress and Its Fat-Building Effects! I should say right at the start that acute short term stress does not result in weight gain. However, long-term chronic stress does. Weight gain occurs when long-term chronic stress begins changing your body’s hormonal balance, which results in a slowed metabolism. Chronic stress increases insulin resistance, lowers levels of estrogen and testosterone, lowers growth hormone and increases cortisol levels… all of which result in a slowed metabolism and weight gain. The stress can be physical, psychological or emotional. Diets that rely on calorie deprivation place a lot of stress on your body and your hormonal system responds by making all the changes in your hormonal system which act to lower metabolism and conserve body weight. Your body cannot tell the difference between a diet and a famine, so the genes you inherited from your starving ancient ancestors switch into survival mode and tell your body to conserve body weight. Of course you know what stress is, right? But let’s take a moment to clarify. Stress is not the thing that is happening.. stress is actually your body’s response to what is happening. It’s your body’s way of responding to any kind of demand, irrespective of whether it is a good or bad experience. When you feel stressed, your body responds by releasing chemicals into your blood. These chemicals give you increased ability to react physically to the event triggering your stress. For example, your heart beats faster, your arteries dilate and blood is sent to the muscles of your extremities and your heart. In effect, you’re ‘primed’ to fight or flight. That is, your body is ready to fight the stress causing event or to run away from it. When early man lived in the open amongst other predators, we evolved the stress response to help us survive. However, modern man is rarely in a situation where either a fight or flight response is appropriate. Much of today’s stress comes from things we can neither fight nor run away from like work stress, relationship stress and peak-hour traffic stress. So our bodies are pumped full of these stress chemicals but we’re not able to dissipate the stress by physical exertion and instead have to resist the stress and remain in control. And when we are exposed to stress over a long time (chronic stress), the chemicals begin to have several deleterious effects on our bodies including weight gain.